This home located in south Kansas City was a two story built in the late 1990s. 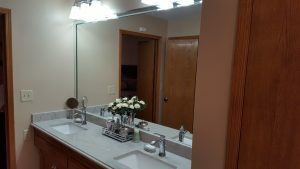 The Remodeling Pro was asked to come in and take a look at several projects including the remodel of three bathrooms and the installation of several new lighting fixtures in other rooms. Working at the Porter house was quite a blessing and we hope the Porters felt the same way. We worked on two smaller bathrooms replace the lavatory counter tops with granite and resetting some of the tiles around the plumbing fixtures. We added new lighting, updated the paint and added granite counter tops. 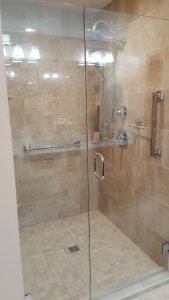 We also added a new tile, low threshold shower and several safety grab bars. We also worked on a soaking tub that needed new fixtures. We moved some fixtures on the tub creating a need to repair the tile in areas. We were able to reuse tile from another location to make it look just like it was always the original tile and location of the fixtures. The project took place over several weeks as we were working on really about 6 separate projects. Thank you to the Porters for having us out to their home and allowing us to complete their remodeling projects.